In October 1911, Sir Robert Falcon Scott and Roald Amundsen raced against each other for the prestige of being the first explorer to reach the South Pole. These two men each led small teams in extreme conditions where planning, preparation, and leadership decided the outcome of the contest. 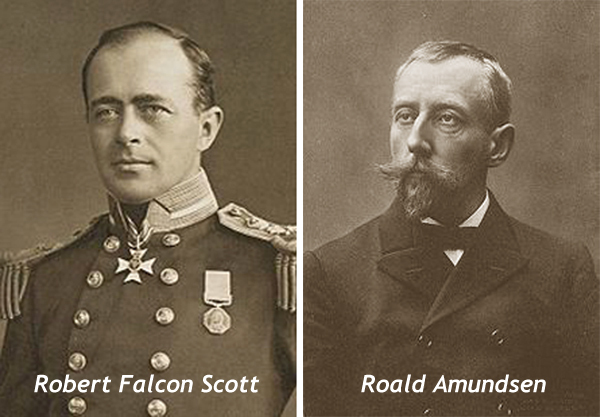 Roald Amundsen not only reached the South Pole 300 miles ahead of Scott, but he also brought all of his men back home alive. The only survivors on Scott’s team, were the journals the men kept. The use of supply caches was the only way the two explorers could successfully make the 1700 mile journey in this unforgiving environment. In order to alleviate the amount of supplies the team hauled during the expedition, each team established these caches halfway to the South Pole. Amundsen understood that friction would wreak havoc on his team. He knew that weather conditions may not be ideal, that navigational instruments may break, and that fatigue may make finding these critical food sources complicated. Their survival rested on the proper marking of these depots. As described by Roland Huntford, “The method [Amundsen] adopted was a line of black pennants on short sticks running east-west across course. Twenty were laid out half a mile apart; ten on each side, making a transverse marking 10 miles long. This was well within any conceivable instrumental error, so that even in thick weather, the chances of missing a pennant were small.” Scott only marked his depots with a single flag, exposing himself to catastrophe when the same friction that Amundsen prepared for paid a visit. Amundsen took every opportunity to learn his craft. He was an avid reader, and read every published memoir on arctic expeditions, taking copious notes, and developing his own theories as he went. He also kept a diary of his own personal experiences, which provided a great source for reflection. He complimented his intellectual growth, with seeking out various experiences to validate what he read. From the use of dogs, to the types of straps on the skis- he constantly tested methods to improve the chances of success for the upcoming expedition. On an earlier trip, when his party had a chance encounter with Eskimos, he spent a winter with them to learn the necessary skills for survival in extreme climates. This ability to develop himself proved invaluable during the race to the South Pole. Scott, on the other hand, failed to learn from the experience of others- to include his own. While Amundsen spent nearly a decade balancing his experience with study, Scott tried to quickly learn everything about polar exploration in two weeks time before his first expedition. While he had copies of memoirs of other polar explorations, there is no evidence that he actually read them. His lack of study and experience caused him to put his faith in untested methods and technology. The horses and motor sledges he brought with him for the expedition were total failure, and were only two of the many errors which led to his team’s demise. Amundsen dedicated his life to polar exploration and as I’ve already described to you, he complimented his experience with extensive reading and reflection. He treated the members of his team with respect and maximized their strengths. Scott on the hand chose polar exploration because in the British Navy it was a “fast track” for promotion for officers. In his diary, he admitted that he had “neither rest nor peace to pursue anything but promotion.” His heart was never in it. His men were just stepping stones on his path to the top, he belittled them, and blamed them when things didn’t go well. He was more concerned with image and promotion than the accomplishment of his mission or the welfare of those under his charge. Ultimately they paid the price for following him. Are you Amundsen or Scott? I highly recommend reading The Last Place on Earth by Roland Huntford. It’s the best leadership book I’ve ever read that isn’t specifically focused on leadership. If you’re tired of Sam Damon and Courtney Massengale, this is the book for you! Next Got the Sequestration Blues? Grab a Map!